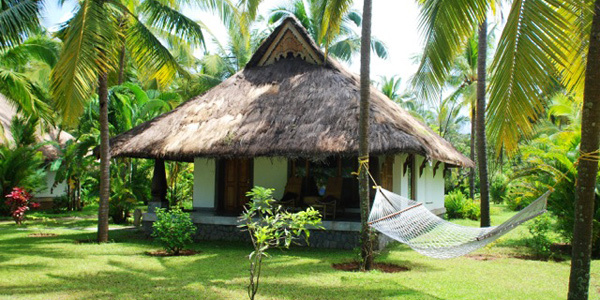 We don’t have many hotels named after gods, but Neeleshwar Hermitage is just that – a spoiling Keralan retreat which shares its nomenclature with Shiva, the God of Transformation (among other things). It’s not an accident; the warm and welcoming hosts encourage you to forget all troubles and ‘start your life anew’. It’s a bold claim, but if there‘s any idyllic hideaway that can do it, this cluster of 16 cottages (and one houseboat) on the calm and stunning Indian coast, is it. Just metres back from the beautiful beach (with swimmable sea) is the hotel’s large infinity pool and spacious wooden cottages, set within 12 acres of lush gardens. With its Ayurvedic spa, yoga lessons and sublime seclusion, the emphasis at Neeleshwar is staunchly – and triumphantly – on unadulterated relaxation. Rooms: The 16 traditional, thatched cottages are spread out in 2 tiers across the lovely gardens. They’re all pretty much identical, although half are detached while the other half are paired for families or friends. 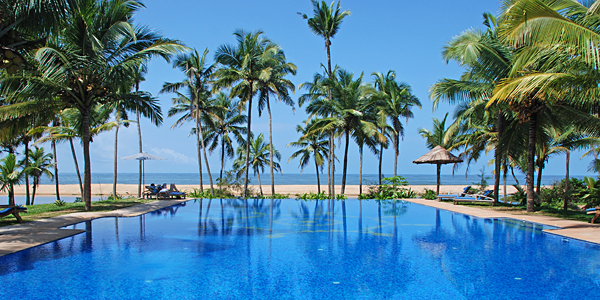 The only other difference is the direction they face – you can opt for a garden view, a pool view or a sea view. Inside, uniformity doesn’t stand for drab. Bedside tables and Planters-style twin chairs were carved by local craftsmen, and there are small writing desks as well as cavernous wardrobes. Contemporary art, silk bedrunners, a duck-egg blue wall and hand-woven rugs atop teak floors add a bit of pizazz. The beds are huge, with lovely white linens. 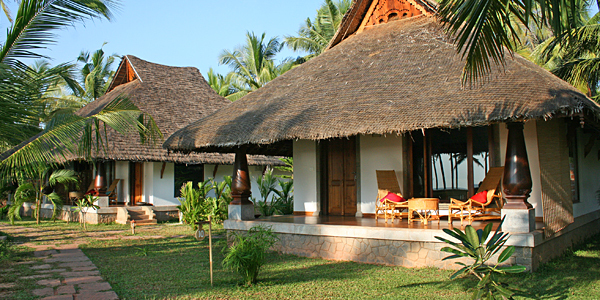 Despite the ornate inclusions, the overall feeling is one of considered minimalism, which makes the cottages feel large – something that’s aided by the teak verandas leading out to the beautiful scenery. Mod cons haven’t been forgotten: as well as an in-house stereo system and WiFi, you’ll find a Bose dock for your iPod, a safe box, and air-conditioning to supplement the overhead fans. 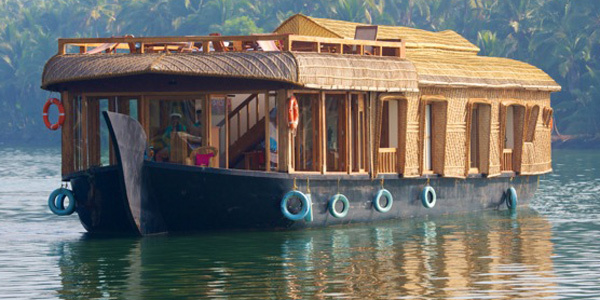 You can also opt (and we suggest you do) to explore the river with a night or two on Neeleshwar’s houseboat, The Lotus. On board you’ll find 2 stunning all-teak bedrooms with large observation windows and a private outdoor area. Discovering the untrammelled backwaters on this gorgeous boat was the highlight of our stay. Food: You can choose from 2 restaurants. Fully licensed Annapuma sits in an open pagoda-style structure roofed in coconut palms, and is the perfect spot to enjoy a mix of North and South Indian, Middle Eastern and European dishes. They’re mostly vegetarian with specialities such as idli and dosa (spicy savoury rice cakes and pancakes respectively), bathal (similar to bahjis) and, of course, Keralan-style fish and chicken dishes. 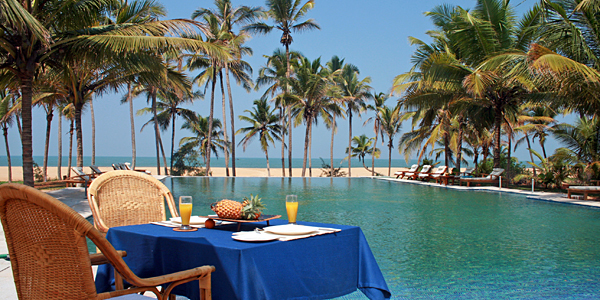 The second restaurant, Meenakshi, is close to the pool and the beach, allowing guests to dine with their toes in the sand beneath swaying palms. At lunchtime a blackboard menu offers fresh and delicious concoctions from the local markets, with fish and seafood featuring heavily. A continental breakfast is available in either restaurant until 10am, and a complimentary afternoon tea with locally made biscuits is served daily in Meenakshi. If you take a cruise onThe Lotus, you’ll find a bar and a modern kitchen, plus indoor and alfresco dining areas. A personal chef is part of the crew. Top Tip: Join in the Indian cooking lessons to hone your culinary skills – a different dish is taught on site every day and you can buy all the spices locally to take home with you. Also, from September to March endangered sea turtles hatch their eggs on the beach – a privilege to witness.